I’m afraid all the research I did for my last post on the threat of economic depression left me a bit… well, depressed. Economic downturn, PMS and the compulsive mind a bitter cocktail mix. So I have been searching for a quiet spot in the din ever since, and perhaps even one of those elusive green shoots we heard so much about not so long ago. What has come to mind is something I read over a year ago in The Huffington Post. The article was about the California Institute of the Arts and featured the words of the school’s president Steven Levine. Apparently, he is optimistic about the collapse of the economy because he believes it will be good for the arts. “When you can’t define yourself any longer by what you can buy, you suddenly have to look deeper for what life is about and I think that gives an opening for the arts that it hasn’t had before, an opening for it to matter again,” he explained. Lavine’s words stayed with me because I’d been having the same thought. I see the potential for deep individual and communal growth to come out of all the loss at hand, a redefining of who we are and what is important to us. I do not mean to diminish the gravity of the situation, as I know for many the consequences of economic loss have been and will continue to be dire. But having a background in the arts makes me look to the power of the salve it offers, as I imagine the comfort will be welcome in treating the wounds we are left with. Beyond that, art is the exercise of creativity, and creativity will provide solutions. 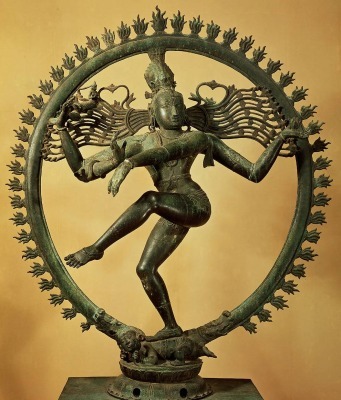 I remember on a trip to the Los Angeles County Museum of Art as a child I came across a statue portraying the Hindu God Shiva as Nataraja, “The Lord of Dance.” He danced in a circle of fire with his hair flowing out behind him on either side and legs and arms bent in motion. I was struck by the form and the symbolism. You may know the image, as it is a popular portrayal of Shiva. In his upper right hand he holds a drum, on which he creates language with each beat becoming a syllable. In his upper left hand he holds a vessel of fire which gives the power to destroy. Shiva’s dance is one of destruction in order to prepare for creation; it is a symbol of the cycle which gives rise to both forces and binds them inextricably together. That which is no longer stable and useful must be cleared to make room for new growth. A third hand is held in a gesture of fearlessness. This gesture assures us of the stability of the world. And herein lies an important idea. Shiva remains serene and upright in the midst of the whirling battle that surrounds him. There is a profound balance maintained as the forces of creation and destruction converge in their fiery cycle. If we look closely at Shiva’s hair we see the currents of the mighty river’s flow, with Ganga the river goddess moving through his winding locks. This refers to the story of her descent to earth. In the myth it is necessary for her to come to wash the earth and purify the ashes of the dead, but her descent from heaven threatens to destroy the whole world. Because of one man’s piety and commitment, Shiva agrees to break the fall of the river goddess, and the flood crashes into his hair before splashing safely to earth. Ganga’s great river purifies all in its path and the earth is reborn. Here The Paper Boat finds itself tripping along the ripples of sacred waters. We enter a time of great destruction, but amidst the chaos an opening emerges. A clearing grows. We find ourselves facing the dilemma opportunity presents. There is space developing for something new. What will it be? What do we paint upon the blank canvas? Nature abhors a vacuum. Something will be built. If we embrace the challenge there is opportunity for evolution here. Creativity is the key.